The Sun seen on 9 April 2019. Photo by courtesy of SOHO/MDI/spaceweather.com. Click here and here to read the about the last long solar minimum. Click here, here, here and here to read about predictions on the current and the next sunspot cycle, cycle 24 and 25, respectively. Daily observations of the number of sunspots since 1 January 1900 according to Solar Influences Data Analysis Center (SIDC). The thin blue line indicates the daily sunspot number, while the dark blue line indicates the running annual average. The recent low sunspot activity is clearly reflected in the recent low values for the total solar irradiance. Data source: WDC-SILSO, Royal Observatory of Belgium, Brussels. Last day shown: 31 March 2019. Last diagram update: 3 April 2019. Click here to read NASA Science News on the present (March 2013) low solar activity. Daily observations of the number of sunspots since 1 January 1977 according to Solar Influences Data Analysis Center (SIDC). The thin blue line indicates the daily sunspot number, while the dark blue line indicates the running annual average. The recent low sunspot activity is clearly reflected in the recent low values for the total solar irradiance. Compare also with the geomagnetic Ap-index. Data source: WDC-SILSO, Royal Observatory of Belgium, Brussels. Last day shown: 31 March 2019. Last diagram update: 3 April 2019. In 1848 the Swiss astronomer Johann Rudolph Wolf introduced a daily measurement of sunspot number. His method, which is still used today, counts the total number of spots visible on the face of the sun and the number of groups into which they cluster, because neither quantity alone satisfactorily measures sunspot activity (NOAA's National Geophysical Data Center; NGDC) . An observer computes a daily sunspot number by multiplying the number of groups he sees by ten and then adding this product to his total count of individual spots. Results, however, vary greatly, since the measurement strongly depends on observer interpretation and experience and on the stability of the Earth's atmosphere above the observing site. Moreover, the use of Earth as a platform from which to record these numbers contributes to their variability, too, because the sun rotates and the evolving spot groups are distributed unevenly across solar longitudes. To compensate for these limitations, each daily international number is computed as a weighted average of measurements made from a network of cooperating observatories. 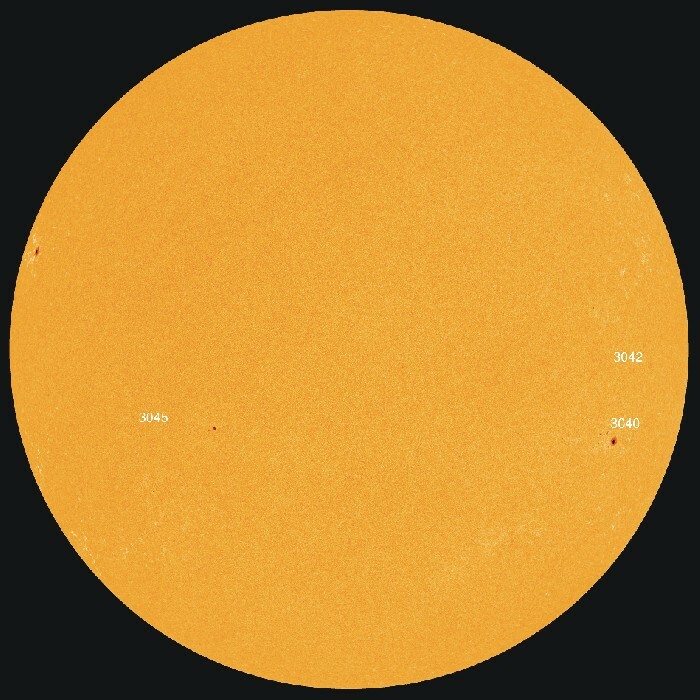 Today, much more sophisticated measurements of solar activity are made routinely, but none has the link with the past that sunspot numbers have (NOAA's National Geophysical Data Center; NGDC) . Total solar irradiance since 25 February 2003, according to the Laboratory of Atmospheric and Space Physics (LASP). These data are obtained using the SORCE Total Irradiance Monitor (TIM). The thin line indicates daily TSI values, while the thick line represents the running simple 183 day (c. 6 months) average. The measured values for the total solar irradiation (TSI) are somewhat lower than reported by most other TSI-measuring instruments, which typically report TSI values around 1366 W/m2. Click here to read about the background for this difference, or see the text paragraphs below this diagram. However, the low sunspot activity 2006-2010 is clearly reflected in the TIM data provided by LASP. Last day shown: 1 April 2019. Last diagram update: 9 April 2019. Click here to download the entire series of TSI data from the Laboratory of Atmospheric and Space Physics (LASP). Click here to make use of an online data plot facility kindly made available by LASP. The SORCE Total Irradiance Monitor (TIM) measures the Total Solar Irradiance (TSI), a measure of the absolute intensity of solar radiation, integrated over the entire solar irradiance spectrum. The TIM's measured value of TSI at 1 AU is lower than that reported by other TSI-measuring instruments; an upcoming solar minimum value of 1361 W/m2 is estimated from the above TIM data. This is due to unresolved differences between the various TSI instruments in operation. The TIM measures TSI values 4.7 W/m2 lower than the VIRGO and 5.1 W/m2 lower than ACRIM III. This difference exceeds the ~0.1% stated uncertainties on both the ACRIM and VIRGO instruments. Differences between the various data sets are solely instrumental and will only be resolved by careful and detailed analyses of each instrument's uncertainty budget. LASP report only the TSI measurements from the TIM, and make no attempt to adjust these to other TSI data records. The TIM TSI data available are based on fundamental ground calibrations done at CU/LASP, NIST, and NASA. On-orbit calibrations measure the effects of background thermal emission, instrument sensitivity changes, and electronic gain. The TIM TSI data products have been corrected for instrument sensitivity and degradation, background thermal emission, instrument position and velocity, and electronic gain. The TIM relies on several component-level calibrations, as no calibration source or detector is available with the level of accuracy desired for this instrument -- a level of accuracy nearly 10 times better than that previously attempted for space-based radiometry. Annual sunspot activity since 1700 according to the Solar Influences Data Analysis Center (SIDC). The blue line shows annual values, red line shows the running 11 yr average. Last year shown: 2014. Last diagram update: 4 May 2015. Click here to download the entire annual sunspot number data series since 1700 from the Solar Influences Data Analysis Center (SIDC). Solar irradiance and sunspot number since January 1979 according to NOAA's National Geophysical Data Center; NGDC. The thin lines indicate the daily irradiance (red) and sunspot number (blue), while the thick lines indicate the running annual average for these two parametres. The total variation in solar irradiance is about 1.3 W/m2 during one sunspot cycle, as an order of magnitude. Click here to download the composite series of irradiance data 1978-2003 (file name: composite_d25_07_0310a.dat). Click here or here to download the entire series of daily NOAA NGDC and Solar Influences Data Analysis Center (SIDC) sunspot number since 1818, respectively. The number of sunspots correlates with the intensity of solar radiation over the period (since 1979) when satellite measurements of absolute radiative flux were available. Since sunspots are darker than the surrounding photosphere it might be expected that more sunspots would lead to less solar radiation and a decreased solar constant. However, the surrounding margins of sunspots are hotter than the average, and so are brighter; overall, more sunspots increase the sun's solar constant or brightness. The variation caused by the sunspot cycle to solar output is relatively small, on the order of 0.1% of the solar constant (a peak-to-trough range of 1.3 W/m2 compared to 1366 W/m2 for the average solar constant). This number refers to the projected area of planet Earth, as seen from the Sun. However, the total surface area of the planet is four times the projected area, and the variation of 1.3 W/m2 therefore corresponds to about 0.325 W/m2 for the entire planet surface. This value might be compared with the IPCC 2007 estimate of 1.6 W/m2 for the total effect of all recognized climatic drivers 1750-2006, including release of greenhouse gasses from the burning of fossil fuels. During the Maunder Minimum in the 17th Century (c.1650-1720) there were hardly any sunspots at all, and in all likelihood, the intensity of solar radiation was low. This event coincides with a documented period of maximum cooling within the Little Ice Age. Irradiance is the radiometry term for the power of electromagnetic radiation at a surface, per unit area. Irradiance due to solar radiation is also called insolation. Total solar irradiance describes the radiant energy emitted by the sun over all wavelengths that falls each second on 1 square meter outside the earth's atmosphere, a quantity proportional to the "solar constant" observed earlier in this century. It measures the solar energy flux in Watts/square meter. Solar irradiance since 1610 as reconstructed by Lean et al (1995) and Lean (2000). The thin line indicates the annual reconstructed solar irradiance, while the thick line shows the running 11 average. The values shown include a background component. See Lean (2000) for discussion of the amplitude of the background component. Last year included in the Lean (2000) analysis: 2000. The small green columns in the bottom panel indicate different kind of historical evidence for past climate change effects. Click on the green columns for more information on each of these events. Last diagram update: 24 April 2009. Click here to download the data series of reconstructed solar irradiance 1610-2000. Solar irradiance since 1610 as reconstructed by Lean et al (1995) and Lean (2000), until 2000. From 2001 data from PMOD/WRC are used. The thin line indicates the annual reconstructed solar irradiance, while the thick line shows the running 11 average. The values shown include a background component. See Lean (2000) for discussion of the amplitude of the background component. See Fröhlich (2000, 2003) for a description of the PMOD data. Last year shown: 2014. Last diagram update: 26 May 2015. Click here to download the Lean data series of reconstructed solar irradiance 1610-2000. Click here or here to download data from PMOD/WRC, Davos, Switzerland. PMOD/WRC and the VIRGO Experiment on the cooperative ESA/NASA Mission SoHO are acknowledged for providing data. Solar variability last 9400 years, according to Steinhilber et al. 2012. The final values in the reconstructed data series may be somewhat too high due to contamination from atomic bomb tests. Click here for data series. Variation of global average satellite air temperature (temperature Quality Class 1) and observed sunspot number (Solar Influences Data Analysis Center (SIDC) since 1976. The thin lines represent the monthly values, while the thick lines is the simple running 37 month average, nearly corresponding to a running 3 yr average. The somewhat asymmetrical temperature 'bump' around 1998 are reflecting oceanographic El Niño effects. Last month shown: March 2019. Last diagram update: 7 April 2019. Variation of global surface air temperature (HadCRUT4) and observed sunspot number (Solar Influences Data Analysis Center (SIDC) since 1976. The thin lines represent the monthly values, while the thick lines is the simple running 37 month average, nearly corresponding to a running 3 yr average. The somewhat asymmetrical temperature 'bump' around 1998 are reflecting oceanographic El Niño effects. Last month shown: January 2019. Last diagram update: 7 March 2019. Click here to download the series of estimated HadCRUT4 global monthly surface air temperature anomalies since 1850. Click here to download the entire sunspot number data series since 1818 from the Solar Influences Data Analysis Center (SIDC). Variation of global surface air temperature (HadCRUT4) and observed sunspot number (Solar Influences Data Analysis Center (SIDC) since 1960. The thin lines represent the monthly values, while the thick lines is the simple running 37 month average, nearly corresponding to a running 3 yr average. The variation in global temperature is about 0.2oC during one sunspot period, superimposed on the general increasing temperature trend during the period shown. The somewhat asymmetrical temperature 'bumps' around 1973 and 1998 are reflecting oceanographic El Niño effects. Last month shown: January 2019. Last diagram update: 7 March 2019. Variation of global sea surface temperature (HadSST3) and observed sunspot number (Solar Influences Data Analysis Center (SIDC) since 1960. The thin lines represent the monthly values, while the thick lines is the simple running 37 month average, nearly corresponding to a running 3 yr average. The variation in global temperature is about 0.2oC during one sunspot period, superimposed on the general increasing temperature trend during the period shown. The somewhat asymmetrical temperature 'bumps' around 1973 and 1998 are reflecting oceanographic El Niño effects. Last month shown: January 2019. Last diagram update: 7 March 2019. Note to the diagram above: The variation in global sea surface temperature is 0.15 - 0.2oC during one sunspot period, superimposed on the general increasing temperature trend during the period shown. The somewhat asymmetrical temperature 'bumps' around 1973 and 1998 are reflecting oceanographic El Niño effects. Click here for frequently read paper on solar activity and surface air temperature in the Nordic region. This is an open access paper from Elsevier. Variation since 1960 of global sea surface temperature (HadSST3), observed sunspot number (Solar Influences Data Analysis Center (SIDC), and Specific atmospheric humidity (g/kg) at 300 mb altitude (Earth System Research Laboratory (NOAA)). Base period: 1961-1990. The thin lines in the diagram represent the monthly values, while the thick lines is the simple running 37 month average, nearly corresponding to a running 3 yr average. Last month shown: January 2019. Last diagram update: 7 March 2019. Note to the diagram above: The variation in global sea surface temperature is 0.15 - 0.2oC during one sunspot period, superimposed on the general increasing temperature trend during the period shown. The somewhat asymmetrical temperature 'bumps' around 1973 and 1998 are reflecting oceanographic El Niño effects. Also the amount of atmospheric specific humidity is apparently showing variations in concert with variations in solare activity. Variation of cosmic ray intensity and monthly sunspot activity since 1958 according to the Germany Cosmic Ray Monitor in Kiel (GCRM) and NOAA's National Geophysical Data Center (NGDC), respectively. High sunspot activity correlates with low cosmic ray intensity, and vice versa. Last month incorporated: August 2009 (GCRM) and October 2009 (NGDC). Last diagram update: 6 November 2009. Click here to download the entire series of monthly GCRM cosmic ray counts since January 1958. Click here to download the entire series of monthly NOAA NGDC sunspot number since January 1749. Galactic cosmic rays (GCR) are energetic particles originating from space that impinge on Earth's atmosphere. Almost 90% of all the incoming cosmic ray particles are protons, about 9% are helium nuclei (alpha particles) and about 1% are electrons (beta minus particles). The term "ray" is a misnomer, as cosmic particles arrive individually, not in the form of a ray or beam of particles. The flux of galactic cosmic rays varies inversely with the solar cycle. Svensmark and Friis-Christensen (1997) suggested that galactic cosmic rays enhance low cloud formation, explaining variations on the order of 3 percent global total cloud cover over a solar cycle. A 3 percent cloud cover change corresponds to a radiative net change of about 0.5 W/m2, which may be compared with the IPCC 2007 estimate of 1.6 W/m2 for the total effect of all recognized climatic drivers 1750-2006, including release of greenhouse gasses from the burning of fossil fuels. Click here to read more about clouds in general, and click here to read more about the climatic influence of clouds. Ap-index according to the National Geophysical Data Center (NGDC). The thin line shows monthly values, and the thick line shows the running 37 month average (c. 3 yr average). Compare with the daily sunspot number. Last month shown: February 2019. Last diagram update: 5 March 2019. Click here to download the Ap data series from NGDC since January 1991. The Ap-index is a measure of the general level of geomagnetic activity over the globe for a given day. Daily regular magnetic field variation arise from current systems caused by regular solar radiation changes. Other irregular current systems produce magnetic field changes caused by the interaction of the solar wind with the magnetosphere, by the magnetosphere itself, by the interactions between the magnetosphere and ionosphere, and by the ionosphere. The Ap-index is derived from measurements made at a number of stations world-wide of the variation of the geomagnetic field due to currents flowing in the earth's ionosphere and, to a lesser extent, in the earth's magnetosphere. The official values for Ap (and other related indices of geomagnetic activity such as the three-hour Kp index) are calculated by the GeoForschungsZentrum Potsdam Adolf-Schmidt-Observatory for Geomagnetism, D-14823 Niemegk (Germany). Over many years, values of Ap provide a maximum disturbance measure useful to identify major geomagnetic storms chronologically (by date and start time) and by amplitude from largest to the smallest. The earliest possible values are for 1932, because that is the first year for which the standard Kp and ap indices were produced. As NGDC staff or others have time to update Ap*, tables of values are available from 1932 to recent times. They are available by FTP transfer from the NGDC website. Oulu (Finland) neutron monitor, monthly average values. Values are adjusted for barometric pressure and efficiency. Last month shown: February 2019. Last diagram update: 5 March 2019. Click here to download the original data (select monthly time resolution). Observed monthly sunspot number (Solar Influences Data Analysis Center (SIDC) since April 1964, and (lower panel) monthly average counts of the Oulu (Finland) neutron monitor, adjusted for barometric pressure and efficiency. Last month shown: February 2019. Last diagram update: 5 March 2019. Click here to download the entire daily sunspot series since 1818 from the Solar Influences Data Analysis Center (SIDC). Click here to download the original neotron count data (select monthly time resolution).